This post is part of our "popular mythology" series, investigating the intersections of religion and popular culture. 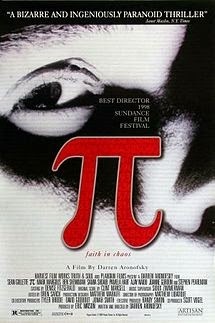 I’ve been a fan of Darren Aronofsky since the release of his debut (feature) film, Pi, in 1998. I was so struck by its stark minimalism, black and white photography, frenetic pacing, and provocative content – not to mention the edgy soundtrack – that I’ve gone back many times since then to drink from its waters. To this day it remains in my top 5 films of all time. Recently, I saw Noah (2014), Aronofsky’s latest film, and while it’s not his best effort, it made me think about his more humble beginnings and how those early sensibilities are woven throughout his work. Interestingly, by identifying those main threads and tracing them forward, we get a strong sense of what makes Aronofsky tick. If it’s true that he is mostly concerned with human obsession and the Promethean penchants that drive it, perhaps filmmaking is how he works out his own obsessions, and how he achieves catharsis. Whatever the case, it’s not stretching to suggest that Pi lays the foundation and sets the stage for everything that follows. In that film, Max Cohen (Sean Gullette) is the central character and focal point of the story. Max is a mathematics and technology genius, holed up in his small Chinatown apartment, obsessed with finding the underlying numerical pattern he believes the global stock market rests on. His particular brilliance, along with his insecurities and growing paranoia, are fuelled by the conviction that everything in the universe can be, indeed, must be, reduced to purely mathematical terms. Given the necessary intellectual exertion and the right key, Max is convinced it’s only a matter of time until the tumblers align and he unlocks the secret. Ten years ago a fellow Capernwray student laid hands on my husband Josh and prayed for God to heal his stutter. The young man insisted he’d had a great deal of luck in the past, a near perfect track-record of banishing illness and disability in the name of the Lord. So Josh sat quietly with the man’s hands on his forehead, nervously awaiting the moment when the prayer would end, eyes would open, and he would have to speak.